August is Children’s Eye Health Month. August is Children’s Eye Health month, which is convenient since it’s almost time to head back to school. While children are too young for LASIK procedures, we’re here to share some tips on how to keep your kiddos’ eyes as healthy as possible. 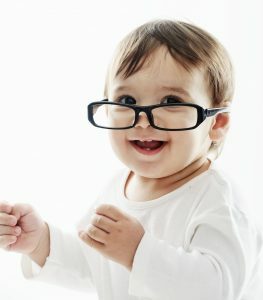 Unless your child has exhibited symptoms of a more serious eye conditions, eye examinations can generally begin around age three. Annual pediatric appointments will conduct basic eye tests. Your pediatrician should be able to determine if your child should see an ophthalmologist. Kids need eye protection, too! Most children are incredibly active, whether in sports or just being kiddos. Be sure to provide protective sports eyewear whenever possible. HAP estimates that children make up the majorityof the 42,000 sports-related injuries that occur each year (https://www.hap.org/health/topic/eyemonth.php). It’s also important to carefully supervise children around sharp objects, such as scissors. Additionally, kids need to protect their eyes against UV rays, just as adults do. Invest in hats and UV-blocking sunglasses to protect little eyes from photokeratitis (sunburn of the eye). All of us at EyeLASIK want to make sure your little munchkins are seeing clearly and avoid any injuries. We want to see our smallest patients grow up with healthy vision! 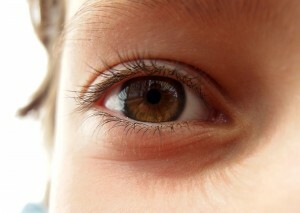 The first eight years of your child’s life are critical for eye development. It’s important to teach your children the importance of eye health and how to properly take care of your eyes. Check out these 4 tips for your child’s eye health! Go Green-Not only is a balanced, nutritious diet good for your child’s overall health and body functions, but it is critical for your child’s eye health as well! Think dark leafy greens (broccoli, kale, spinach) and yellow veggies (squash, carrots, pumpkin) to ensure plenty of Vitamin C and D intake. Eye Aware-The best defense against eye disease is early detection. Listen to your child if they complain about eye pain or irritation. Watch for symptoms like headaches, blurred vision, rubbing of eyes, etc. and be sure your child sees an eye doctor twice a year, or as often as recommended by your doctor. Learn some basic tips about your child’s eye health! Protect Against UV Rays-When your child is outside, encourage them to wear a wide-brimmed hat or cap as well as sunglasses. Not only will a hat help to protect their skin, but wearing a hat and sunglasses will reduce the amount of UV reaching your child’s eyes by half! Sport Protection-Discuss with your child proper safety procedures before playing sports with high velocity ball action such as tennis, soccer, basketball, baseball and hockey. If necessary, encourage your child to wear goggles or other protective eyewear. There are a lot of factors involved in your child’s eye health, including genetics, environment, lifestyle, and nutrition. However, using these 4 tips above can help with any risk of eye disease and help your child live a healthy life with clear vision! If you enjoyed these tips, subscribe to our newsletter for more tips, tricks and all the latest from Eye LASIK Midland! How Does Computer Use Affect Children’s Vision? When pediatric ophthalmologists are consulted about the biggest issue that is facing our young people, invariably they say it’s the destruction of our children’s vision due to extensive computer usage. Gone are the days where computers are used only by adults and only in a work environment. Children’s vision is progressively more likely to develop myopia than in anytime in the past. Children’s vision preservation is paramount, and a good way to start is limiting their access to computers. Children today have computer access at home and school, for educational and recreational pursuits. Children often ignore problems, and believe if they are having difficulty seeing that it is not a cause for concern. Computer vision syndrome is a real medical issue. It can cause headache, dry eye, eye discomfort, fatigue and blurred vision. For children, especially, computer vision syndrome can adversely affect their school performance. Children’s vision is valuable, and for the sake of future success in school, and life, it must be protected. 94% of American families have computers with Internet capabilities. It would be naive for parents or other caregivers to believe that all of the average 7 hours children between the ages 8 and 18 spend on the computer relates to purely educational websites. Games and social sites are unquestionably a large part of the 7 daily hours, in addition to time spent on cell phones and tablets. However, these days computers can be seen as necessary evils. But one cannot minimize the inherent problems in our children’s usage of this particular piece of technology. Part of the issue is that computers, primarily made for adults, do not fit the user. Children are smaller than adults and should therefore use different computer practices. A computer monitor should be positioned between 20-26 inches from the child. An adjustable chair must be used to make sure his feet can comfortably touch the floor in order to avoid arm, neck and back problems. Often the visual demands of a task exceed the visual abilities of an individual to perform the task. Children’s vision has to mature along with the child. You cannot expect a child to be capable of advanced tasks that require him to pay attention to more than one thing at a time. What can you, as a parent, do to protect your children’s vision? First of all, you should limit their usage of computer primarily for school, with occasional recreational use. If a child is showing signs of dry eyes, rubbing their eyes or squinting, then perhaps lubricating eye drops or special computer glasses may alleviate the problem temporarily. Set a rule that for every hour on the computer, they must take a 20 minute break and do something outside that requires physical activity. Reduce the amount of light in the room where the computer is, by using shades, curtains and screen covers. This will minimize the glare on the screen while it is being used. The bottom line when it comes to children’s vision and computer use is that adults must monitor children’s computer use, as it is simply not a concern of the children involved. Enjoy this blog? Sign up for our newsletter to receive more helpful vision tips. Click HERE! When you have a baby you’re always marking your calendar for pediatrician appointments assuming they check it all. But what about the eyes. According to the American Optometric Association (AOA), infants should have their first comprehensive eye exam at 6 months of age. Children then should have additional eye exams at age 3, and just before they enter the first grade — at about age 5 or 6. Although 6 months may seem young, the six-month exam is also to make sure the baby’s eyes are developing normally. An eye doctor can spot a condition commonly known as “lazy eye” (the medical term is amblyopia) very early in a child’s life. And, early treatment can stop bigger problems down the road. Other exams should be in the 3 to 4-year-old range, because the eyes have basically done their growing and developing by then. And a pre-kindergarten exam is a must (don’t assume school-offered vision screenings are enough). After that, a yearly trip to the eye doctor will keep tabs on young eyes that can change fast. A child’s eye exam will also focus on the classic vision problems: nearsightedness (myopia), farsightedness (hyperopia), structural irregularity in the eye (astigmatism) and a few other conditions, too. In between those yearly eye exams, keep a look out for symptoms of eye problems in your child. Because, like everything else going on with their little bodies, their eyes can change seemingly overnight. Alignment problems. If one eye keeps “drifting off,” it could be “lazy eye” or amblyopia. Treatment includes a corrective eye patch on the normal eye so it forces the weaker eye to work harder and improve. The younger the child, the better to avoid a grade-school patch. Eye rubbing. If your child rubs his or her eyes or you hear complaints of headaches, see the eye doctor. There may be some eyestrain going on that glasses can help. Remember that proper vision at an early age is vital to insure your child has the visual skills he or she needs to perform well in school. Be sure you receive all our tips for healthy vision for your whole family by signing up for our newsletter. Click HERE! Summer vacation for school-age children means outdoor play and long hours at the pool or beach. The increased sports activity and exposure to ultraviolet rays also means an increased risk to children’s eyes. New research shows that children’s eyes can be damaged from sun exposure, just like their skin. This damage may put them at increased risk of developing debilitating diseases such as cataracts or macular degeneration as adults. Most parents are aware of the critical need to protect their children’s skin from UV exposure, yet few insist their children wear sunglasses. Wearing protective goggles during sports activity is also highly recommended. The National Eye Institute reports there are more than 100,000 sports-related eye injuries every year with 42,000 requiring emergency care. 1. Make sure your kids wear sunglasses-especially younger children. Half the entire time we spend outdoors in our lives occurs before 12-years of age. Sunglasses for children may be purchased inexpensively at many retail and online outlets but make sure the sunglasses you purchase are rated to block both UVA and UVB radiation. All sunglasses block UVB, but some do not block UVA rays, which are damaging to the retina. Look for glasses with a polycarbonate lens and know that children under six may need a pair with Velcro straps to keep them in place. 2. Wear protective eye gear for ball sports. Every year, some 18,000 sports-related eye injuries are seen in US hospital emergency rooms in this country. While helmets are required for many organized sports like baseball, goggles or face guards usually are not. The American Academy of Ophthalmology recommends that children wear polycarbonate goggles for baseball, basketball and racket sports, including tennis. Regular glasses are not recommended, since they usually are not secured to the head, nor made from polycarbonate. 3. If sand gets in your child’s eyes, don’t let him rub it. If a child gets sand blown or thrown into his eyes, an adult should immediately take the child to a sink with running water. Do not allow him to rub his eyes as this can cause damage to the cornea (outer layer of the eye). Use a clean cup to pour water over the eyes to remove sand particles. Encourage blinking and do not discourage crying, since tears remove eye irritants. If flushing and blinking does not remove the sand particles, seek medical attention. 4. Find and use a non-irritating sunscreen. Generally, adult sunscreens are fine for children. If your child gets a rash from his sunscreen, review the ingredient’s list and choose a different one. Look for one that is PABA free, since that chemical can cause irritation in some individuals. You might also look for one that gets its UVA protection from titanium dioxide or zinc oxide, both inert sun blocking pigments, which tend to be thicker, more stable and less irritating than avobenzone, another common ingredient. Sunscreen is important; your child should not be discouraged from using it because of a fear of irritation. 5. Check the chlorine level in your pool. If a swimming pool has too little chlorine, it can allow algae and other bacteria to grow, which can lead to eye infections. Also, be sure to check the levels of chloramines and the pH of the pool to avoid stinging and redness. One easy solution is to have children wear a pair of goggles that will keep pool water from entering the eye. After swimming in a pool, have your child shower. If redness and irritation persist after swimming, it could be a sign of a more serious infection and should be seen by a physician.